I wake up really early. I’m embarrassed to say how early! I used to wake up, have coffee, workout, get dressed, and then eat… by the time I sat down to breakfast I was starving, edgy and impatient. That is no way to greet my family at the breakfast table. I wasn’t following my own advice of eating within one hour of waking. Inspired by a lecture I attended regarding using food therapeutically during recovery from drug and alcohol addiction and another lecture that I gave on fertility foods, I have gotten back to my green smoothie. After talking about the healing properties green leafy veggies, full of antioxidants, anti-inflammatories and alkalizing affects, I have been motivated to make myself a green drink first thing every morning. I take the Vitamix into our workshop so that I don’t wake anyone up and start my day right! Not only am I starting the day with the best possible nutrition, I am much more pleasant to be around! Place the ingredients in a blender and process about a minute. Use more or less water depending on how “liquidy” you like your drink. 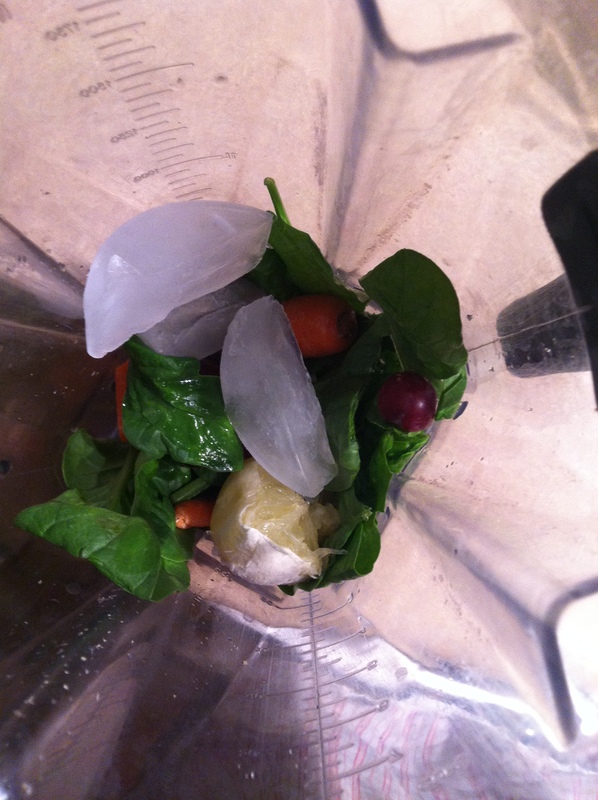 The basic combo of ingredients is: greens, lemon, water and ice. The optional ingredients give tons of variety and different flavors. Ginger is awesome, but it can be spicy, so be cautious with how much you use if this is new for you. 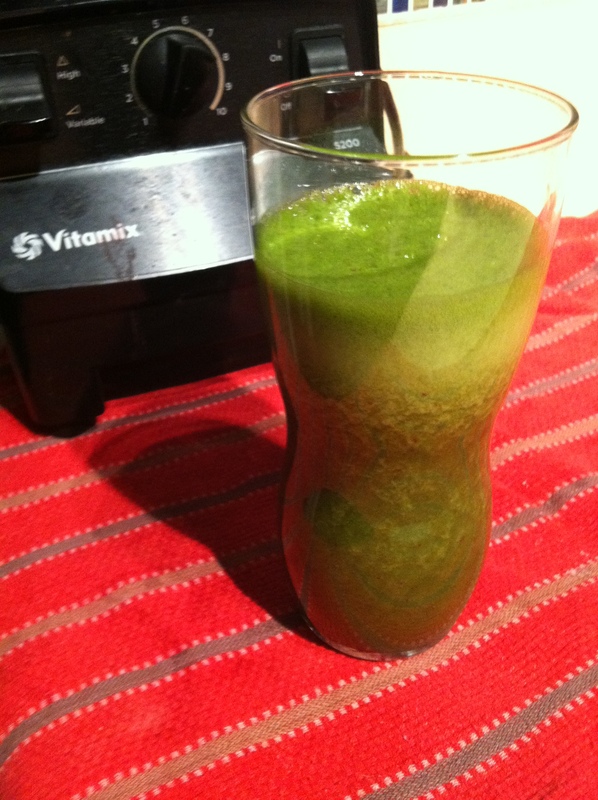 Calories and grams of this and that don’t do this green drink justice. The numbers are distracting from the absolute awesome nutrition that this drink provides you. Simply blend, drink and enjoy! So I no longer wake up ridiculously early. Ok, so that’s not nearly as exciting of news as my new way of making my green drink…frozen apples! I stumbled upon this delicious secret ingredient while preparing to leave for vacation. Before leaving for vacation, I had to clear out the fridge. I didn’t know what to do with the apples and so I sliced them and froze them. Now, they are the best new addition to my Green Drink! The frozen apples give the smoothie a great texture and keeps the flavor rather than diluting the flavor of the drink with ice. Process in blender until liquified. Coconut oil is not new; but I’ve been hearing a surge of interest and questions surrounding coconut oil. I won’t debate those now, but I will share an interesting piece of information that I just learned: the fatty acids in coconut oil nourish the intestinal lining. This is a really good thing for people with digestive health or immune function concerns. I’ve been using coconut oil in cooking and baking for some time now, but I hadn’t used it in my Green Drink. I tried it, and it’s delicious! It gives the drink a great texture and flavor. Place in blender and begin to blend. Drizzle 1-2 tablespoons organic unrefined extra-virgin coconut oil and drop in 3 ice cubes.